If you've had any degree of involvement in the online business and blogging world, you've already heard it: "Pick a niche!" You probably even know a few reasons why. Spoiler alert: content focus and clarity for your readers are pretty big ones. Notice how the title of this post says "define" your niche, not "pick" a niche? Your niche is what you define it to be. Whether it is narrow or a little broader, if you can define it and garner a strategy for it, you have a niche. It sounds pretty easy, right? While it may be common sense, that doesn't make it common practice. I can tell you that at least 15% of my Facebook friends are trying to run a blog. They're writing about what they love, what they're passionate about, and hoping people read it. If you want to take your blog to the next level, passion isn't enough. Passion is only the first step. You need strategy and focus. And action, but that's a discussion for another day. 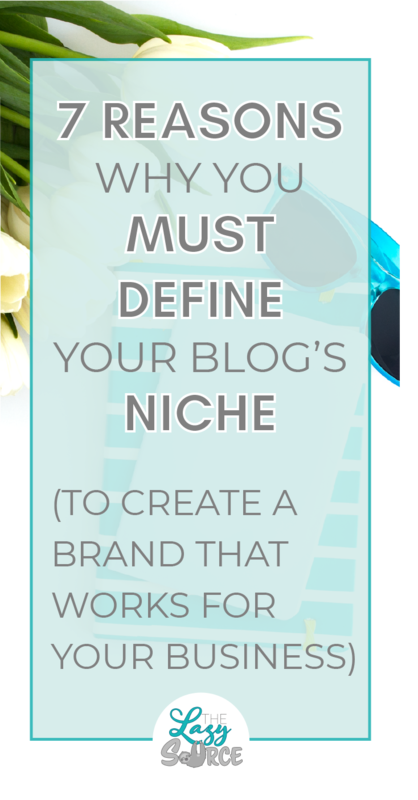 Defining your niche is the foundation of strategy and focus for a blog and business. Here are the 7 most important reasons why you MUST define your niche in order to be successful. 1. When you define a niche, you'll grow the right audience. Growing an audience is hard. Growing the right audience is harder. Traffic is good, readers are great, subscribers are even better. But do you know what tops it all off? These are devoted readers who love to catch your latest posts, provide meaningful follow-up discussion, interact with you, share your content, and above all, buy what you're selling. Engaged fans, if you will, are vital to your success in increasing your income with your blog or business, but more on that in a bit. How do you get engaged fans? You generate interest. How do you generate interest? You capture their attention, pique their curiosity, and then feed them (and no, recipe bloggers, this isn't the time for a potluck dinner. Though I'm totally game if you know how to make buffalo chicken chip dip.) with great content. You need content that is focused on feeding their interests, answering their questions, and solving their problems. A clear niche will ensure your content attracts the people that are going to be interested in your content. Additionally, if your niche is defined, they'll know what to expect from you, what you can give them, and what questions they can have answered by you. They'll know who you are. 2. A niche definition will focus your content and product strategies. Your only solid path to success involves a strategy. A mission, if you will. I like action movies. Without a mission, you don't know your purpose. If you don't know your purpose, no one else does either. Your blog becomes unfocused, unorganized, and just plain confusing. If you're selling a product or service, as you should, all of your content and marketing must direct people to that product or service. Everything you put out for free needs to put people on the path towards what you're selling, either currently or potentially. This requires planning and focus, and you can't focus if you're writing about everything (and thus, nothing). Noticing a theme around focusing yet? If not, here it is again. If your readers don't understand what you're about, they can't care about what you care about. And if they don't care about what you care about, they don't invest in you. Part of the catalyst that led me to restructure my blog (the first time) so soon after my initial launch was my lack of conversion. In my first week, I'd attracted nearly 100 people to my blog (not bad for only "marketing" it for a few days), but no one joined my email list. I tried to analyze my landing page, website appearance, and even my opt-in that I was super proud of, but in the end, I realized those weren't necessarily the problem. My problem was that people were confused by my message. I marketed as a productivity and organization blog for lazy people. My website headers, banners, bio, logo, and opt-in all screamed "productivity and organization!" But the only content on my blog were academic tips for college students. I don't really know how that happened. That's what lack of focus will do to ya. I might have been attracting my "right" audience within my "niche," but my content didn't back up my claims at all! So people left. They didn't understand if I was a student blogger or a productivity blogger, and they weren't interested in learning how to plan in an organized manner (my opt-in) from someone who clearly had no idea what she was doing. Update: Future Katie Fun Fact! I restructured my blog AGAIN in June of 2018 because I still felt like I needed a clearer definition for my readers to grasp! It's okay if you don't get it right the first time. As you start to get to know your readers, your skills, and your passions, you can continue to work toward a more well defined niche that works for both you and your audience. Let your message be clear, from content to website bio, or, I promise, most people won't stick around long enough to try and decipher what you're about. Who are you going to go to when you want to know how to increase your blog's bottom line? A blog about personal finance for single moms or a blog about business skills that can save and make money for your online info business? If you're worried that I went too specific there, it still works for a broader niche. Will you increase your profit margins by visiting a personal finance (general) blog or a business blog? The point is, by having a defined niche, you've got a way to already establish your credentials. Your entire business is one great portfolio of your knowledge of your area. You won't need to put your name in front of everyone, telling them what you have to offer. Instead, your brand alone will tell them who you are. Your content will convince them of your purpose. By the time they get to your sales page, they already know what to expect from you. If I've clearly defined my mission and made it clear who I can help, I'm more likely to draw those people in. As long as I can deliver on my promises, they will begin to trust me. While there's plenty that goes into establishing brand authority so that your marketing can be a little less obnoxious and a lot more fun, establishing your clear niche is of paramount importance to being successful here. I gave you a break but PSYYYCH. It's back. Your marketing needs FOCUS! I covered this briefly when I talked about conversion. People respond to a clear and focused mission. When they know the purpose, they're more interested and more trusting. When you can communicate a consistent message through your marketing strategies and your brand, your reach is going to be that much more powerful. People will get it, they'll hear what you have to say, and they'll come to you for more. But they have to understand your mission. They have to know what they're going to get from you. When you've become the authority on a particular topic (or range of topics), people have a way of finding you. If they have a problem, they're looking for the solution. If you've geared your content and maintained your SEO and Social Media strategies, people will find your solution. Eventually, you'll become the industry go-to. Here's an example. Three of my favorite influencers are Meera Kothand, Krista Dickson, and Gillian Perkins. All three create content about blogging/business. All three cover a wide range of topics. I go to Krista for Pinterest tips and entrepreneurial mindsets. I go to Gillian for product launch strategy and time management. Three people who teach in the same industry, with relatively "broad niches", but three people who have established their authority in specific areas. The point is, when you know what someone is offering, you can go to them for when your problems overlap with their solutions. You begin to trust them, and they become your "source" (wink) for that area. If a person doesn't know what it is you write about, they don't know what they can go to you for. You blog about fashion, he blogs about fashion, she blogs about fashion, everybody blogs about fashion. You blog about being a mom, he probably doesn't blog about being a mom, she blogs about being a mom, mostly everybody blogs about being a mom. And, what we're all thinking: You blog about blogs, he blogs about blogs, she blogs about blogs, everybody blogs about blogs. You know what market saturation is? It's the "C'mon, everybody who's anybody is doing it" of business. If you're here, you've likely done some research into starting a blog. That means you know that there are a ton of blog-bloggers out there right now. Why? It seems like the right thing to do. Everyone who is running a successful blog isn't necessarily sharing about how they got their successful blog. However, everyone who is running a successful "how-to-run-a-successful-blog" blog IS sharing about how they got their successful blog. (Dizzy yet?) Since that's what we see, and we can see it working, everyone wants in. The problem is, now you have a ton of competition. You need to get really creative if you want to differentiate yourself. The greatest way to do this is to define YOUR niche and establish your special area of expertise. My "How to Blog" Blog is fighting your "How to Blog" Blog. However, my "How to Build an Email List" Blog is not competing with your "How to Automate Your Blog Systems" Blog. Again, this isn't me advocating for a tiny specific niche. Rather, the latter two examples have figured out what they want to blog about and have made it clear to everyone else. And by the way, I use "how to blog" blogs as the example here because it's the industry that people get the most riled up about when it comes to blogging market saturation. But this applies to mom bloggers, recipe bloggers, lifestyle bloggers, fitness blogger, fashion bloggers, beauty bloggers, travel bloggers, etc! Some of you have a lot of interests that are going into your blog. Trust me, I totally get it. I, too, am a multi-passioned eternal-hobby-seeker who craves variety. That's why my initial blog launch was an academic/productivity/organization/personal finance/book reviews & recommendations/etc "niche." Heavy on the etc. I didn't get that far with my published posts, but golly, you should have seen my content "calendar". Then my second blog launch was about all things blogging, but with a focus on a narrower audience of day-jobbers. This still proved to be a lot of disorganization, because I just couldn't buckle down and stick to a plan when I could be writing about email marketing one day and Pinterest the next. So, for myself, I buckled down into business finance. I still have a variety of topics I can cover (mindset, monetizing, bookkeeping, budgeting, goal settings, etc! ), but I can focus on a single message to market to my audience: Don't ignore your numbers. Have I convinced you to define your niche yet? Have you decided to find your area of expertise so you can focus and strategize? Are you thinking of ways to turn your generalist blog into something with purpose that can meet needs? Let me know what you're thinking in the comments, or email me at katie@thelazysource.com. And feel free to ask for help! Sometimes an outside perspective can really help you focus in on what matters.